In the high-rise Metropolis condominium building at 8th and Peachtree, a second location of Fadó Irish Pub has opened. Like its older sibling in Buckhead, this Fadó is powered by Guinness and stays open to the wee hours. Fadó Irish Pub, Metropolis, 933 Peachtree St. NE, Atlanta, GA 30309, 404-260-7910. Italian restaurant Colletta has opened in Alpharetta’s Avalon. The menu from executive chef Michael Perez highlights pizza and pasta. Perez and team will make all pasta and even cheeses in-house. There's talk of an in-house curing chamber for crafting salumi, taking "from scratch" yet another step. The all-Italian wine list covers the peninsula and provides notable choices in a variety of price ranges and styles. Colletta, Avalon, 900 3rd St., Alpharetta, GA 30009, 678-722-8335. Charleston's Oak Steakhouse has launched an Atlanta area outpost in Alpharetta's Avalon with Chad Anderson as its executive chef. 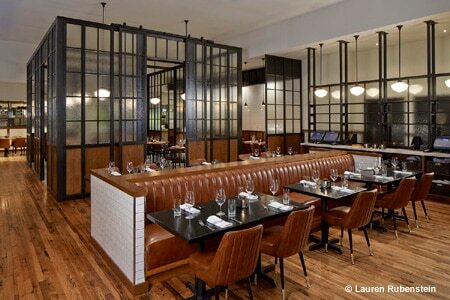 The recently opened upscale living/shopping/dining development has lured a number of in-town establishments to its confines, and from out of state, Oak Steakhouse. With an emphasis on seasonally driven produce and locally grown raw materials, plus its reliance on Prime certified Angus beef, Oak Steakhouse should draw beef enthusiasts from all over the metro area. Oak Steakhouse, Avalon, 950 3rd St., Alpharetta, GA 30009, 678-722-8333. Antico Pizza Napoletana and its companion operation Caffè Gio, a gelateria and pasticceria, have opened in Alpharetta's upscale Avalon development. The pizza establishment has a popular location in Midtown, and its new outpost has attempted to re-create some of the same atmosphere and offers better parking. Caffè Gio also serves panini and other kinds of Italian street fare. Antico Pizza Napoletana, Avalon, 2200 Avalon Blvd., Alpharetta, GA 30009, 770-674-8811. Formerly executive chef at ECCO and Latitude, chef Micah Willix has opened Community Smith in Midtown. The restaurant serves breakfast, lunch and dinner daily. The rooftop space, to be known as The Garden at Community Smith, will open on March 20 with a capacity of 300 seats and a 20-tap brew program. Reared a vegan, Willix emphasizes proteins from humanely raised animals and offers a challenging wine list and lots of bottled craft brews. Breakfast, Lunch & Dinner daily. Community Smith, 866 W. Peachtree St. NW, Atlanta, GA 30308, 678-412-2402. University of Georgia alums and brothers Alan and Ryan Pope have opened The Place in Athens, Georgia, virtually right across the street from the iconic Arch. Naming the restaurant after their name for their grandfather's Atlanta-based car dealership, the brothers offer what they call refined Southern fare; for example, braised pork shoulder with mashed potatoes and roasted vegetables. A classic cocktails program also is available. The lower level is for the main service, while upstairs high-top table and bar seating provide a more casual feel. Décor on both levels features rustic wood elements. The Place, 229 E. Broad St., Athens, GA 30601, 706-850-2988. On March 1, 2015, Miller Union's executive chef and co-owner Steven Satterfield launched his debut cookbook, "Root to Leaf: A Southern Chef Cooks Through the Seasons." Its official release date was March 3. Nominated again for a James Beard Foundation Award for Best Chef Southeast, Satterfield offers in the book 175 recipes focused on vegetables, not because it's a vegetarian cookbook, but to celebrate vegetables. Satterfield explores sundry treatments of vegetables, from braising to pickling --- he's particularly good at pickling --- to canning to roasting. Chefs including Satterfield have discovered Sea Island (a coastal Georgia island) red peas. Swiss chard, chickpeas, Brussel sprouts, Vidalia onions and ramps in spring --- here's where you’ll want to eat the vegetables on your plate. Miller Union, 999 Brady Ave. NW, Atlanta, GA 30318, 678-733-8550. The Ritz-Carlton Lodge, Reynolds Plantation has appointed Andrew Litherland as executive chef of the resort. A native of Auckland, New Zealand, Litherland served as executive chef at The Ritz-Carlton, Atlanta, where he emphasized fresh, local and seasonal fare on the menu. In his new capacity, Litherland will oversee the culinary outputs of the resort’s three restaurants: Linger Longer Steakhouse, Georgia’s Bistro and Gaby’s by the Lake. The Ritz-Carlton Lodge, Reynolds Plantation, One Lake Oconee Trail, Greensboro, GA 30642, 706-487-0600. Having arrived in Atlanta from Chicago's Davanti Enoteca in July 2013, Jonathan Beatty took over the kitchen at ECCO from Craig Richards, who now helms Ford Fry's St. Cecilia. Beatty left ECCO at the end of January, and its owning organization, Fifth Group Restaurants, says it will conduct a national search for a replacement. We don't expect to see changes in the restaurant's philosophy, as it likely will continue to focus on Mediterranean and European fare, with house-made pasta and pizza at its core, but the specifics may as a new chef puts his or her stamp on dishes. ECCO, Atlanta Fencing Club Building, 40 Seventh St. NE, Atlanta, GA 30308, 404-347-9555.